How many highly successful musical artists do you know that have thrived for 20 years without a radio hit, a big budget video, or major label backing? Moreover, have managed to do high-profile TV appearances, own and operate their own independent label since day one, sell several million albums and continue to expand their fan base across the globe each year. They have collaborated with such uniquely famed artists David Byrne, Perry Farrell, The Flaming Lips, Anoushka Shankar, Femi Kuti, Seu Jorge, Bebel Gilberto, and been featured on major film soundtracks such as Garden State. They’ve headlined top music festivals, such as Coachella and Lollapalooza, and have influenced a whole generation of electronic producers and DJs. 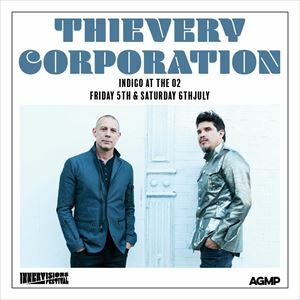 If you add these elements together, you can arrive at only one conclusion: Rob Garza and Eric Hilton, aka: Thievery Corporation.